Sea of Thieves is set to land its first big content update, The Hungering Deep, later this month. We'll know more soon, as Rare plans to come out with a launch date and trailer next week. As previously covered, The Hungering Deep will introduce a new AI threat as part of a "unique event." In today's developer update video, executive producer Joe Neate reiterated that the team hopes to roll out this and future content in a novel way. 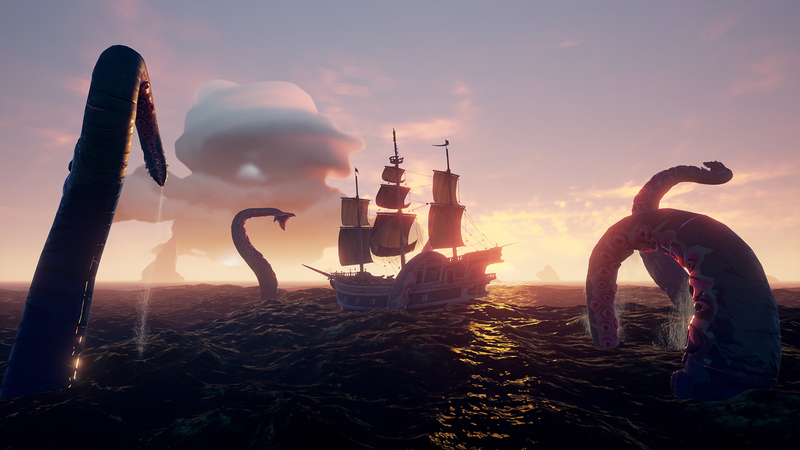 Rare wants to "deliver it in a kind of cool, fun, slightly different way to what we've shown before in Sea of Thieves with a little bit of puzzle solving, a little bit of collaboration with players, that's introducing some of these new mechanics to the world." In the meantime, there's been a change of plans for this week's update. Due to a technical problem that couldn't be resolved in time, this week's patch -- the one that enables private crews, hides player nameplates while they're underwater, and lets players hand items like bananas and cannonballs to one another -- is now scheduled to go live next week. Neate also spoke about a planned tweak to how loot is dispersed in the world. "As you progress through to the higher levels of Sea of Thieves, you're going to be seeing far less of the [not-very-valuable] Castaway chests, which has been a big bit of feedback that we've been seeing from players. So it should feel much more balanced and you should be getting higher rewards." As much as it's been slow going for Sea of Thieves since launch, I appreciate Rare's openness in these videos. Even when it's bad news, I still like hearing about where things are at. Silence is the worst.